In 2015, Treeconomics in collaboration with Davey and Forest Research, completed a study estimating tree canopy cover in Oxford. i-Tree Canopy was used to interpret aerial images across Oxford using 7939 random points. This overall picture was built up by analysing the 24 wards that make up the prestigious city. i-Tree Canopy is a quick and simple method to obtain statistically valid estimates for canopy cover and other land uses based on this point method. Measuring tree cover has helped city planners, urban foresters and communities see trees and forests in a new way, focusing attention on green infrastructure as a key component of community planning, sustainability and resilience. It is an easy-to-understand concept that is useful in communicating messages about our urban forests with the public, policy makers and other stakeholders. The importance of vegetation in urban areas has long been recognised. For example, vegetation provides shading, evaporative cooling and rainwater interception. It has a strong influence on a number of factors including energy demand, air quality and noise pollution, biodiversity, mitigation of the urban heat island effect (UHI), human health and wellbeing. Quantifying tree canopy cover has been identified by many authors to be one of the first steps in the management of the urban forest. As author of Planning the Urban Forest, James Scwab, attests” The first step in reincorporating green infrastructure into a community’s planning framework is to measure urban forest canopy and set canopy goals”. 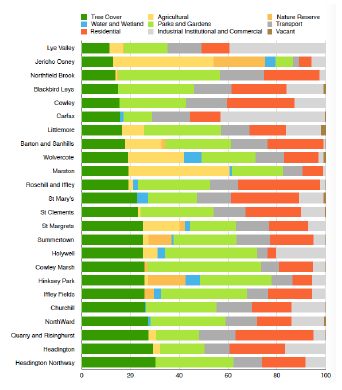 Classification of the 7939 random points across the city estimated Oxford to have over 21% of canopy cover (trees, woodland, shrubs) and over 48% green cover (areas including grass etc). This estimate provides a baseline for tree canopy cover of 21.4%, with 95% confidence intervals. A full list of the canopy cover by Ward is given below, giving percentage ground cover estimates for each land use category. On a ward by ward basis, canopy cover ranges from 11.4% to 30%. Canopy cover was highest in Headington and Headington Northway at 29 and 30 per cent respectively. Canopy cover was lowest in Lye Valley and Jericho Osney at 11.4 and 13 per cent. Following this study, it was recommended that Oxford repeats and monitors aerial image analysis of canopy cover on a 5-10-year basis across Oxford and within its wards. We also recommended that Oxford work towards obtaining, drawing or calculating more detailed canopy cover maps that can be used within a GIS system to observe other trends and patterns. Data collected for this canopy cover assessment is now being used to inform a wider i-Tree Eco study on the city of Oxford in efforts of moving towards this goal, which is due to be released soon.